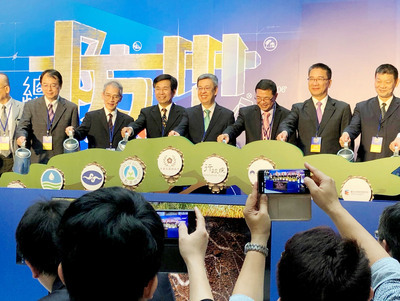 Taipei, April 2 (CNA) The Fair Trade Commission (FTC) said Tuesday that it has received a notice from the potential buyers in the Next Media acquisition, indicating that they wish to withdraw from the deal. The notice was submitted by attorneys representing the consortium of buyers, the FTC said, adding that it will hold an internal meeting Wednesday to discuss the matter. It was previously agreed that Formosa Plastics Group (FPG) Chairman William Wong would acquire 34 percent of Next Media's print assets in Taiwan, Want Want China Times Group President Tsai Shao-chung would buy 32 percent, Chinatrust Charity Foundation Chairman Jeffrey Koo Jr. 20 percent and Lung Yen Life Service Corp Chairman David Lee 14 percent. But the deal reportedly fell through in late March and Next Media Ltd., controlled by Hong Kong media mogul Jimmy Lai, announced that it would retain its print business in Taiwan. According to local media reports, the deal may have fallen through because Want Want China Holdings Ltd. Chairman Tsai Eng-meng, who is Tsai Shao-chung's father, was seeking to pare the number of shares to avoid antitrust queries into his family's media ownership. Next Media said that based on the acquisition contract, the buyer or seller could cancel the deal by submitting a written notice if the transaction could not be completed by the March 27 deadline. Next Media said it had not received any written withdrawal notice from the buyers, but it had informed the consortium orally that it would not extend the deadline. The share price of Next Media tumbled 25.6 percent to close at HK$0.87 on the Hong Kong Exchange Tuesday, the first day of trade in the stock since a suspension on March 26. The company's share price has fallen about 50 percent from a record high of HK$1.76 last year. The National Communications Commission (NCC) has proposed an act to prevent monopolization of the media, which would require NCC approval of any mergers in the broadcasting and print media sector. Under the proposed bill, the NCC would have to consult with the FTC before giving approval for any media mergers, except in cases involving only the print media, which would require only FTC review.